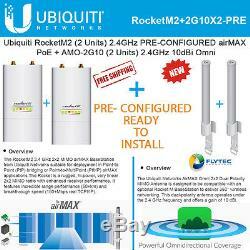 Ubiquiti RocketM2 RM2 2.4GHz (2 Units) - PRE-CONFIGURED/ READY TO INSTALL. The RocketM2 2.4 GHz 2x2 MIMO airMAX BaseStation from Ubiquiti Networks features a mix-and-match industrial design, that supports speeds of up to 150+ Mb/s real TCP/IP throughput. It is suitable for deployment in Point-to-Point (PtP) bridging or Point-to-MultiPoint (PtMP) airMAX applications. The Rocket is a rugged, hi-power, very linear 2x2 MIMO radio with enhanced receiver performance. It features incredible range performance (50+km) and breakthrough speed (150+Mbps real TCPI/IP). The device was specifically designed for outdoor PtP bridging and PTMP Airmax base-station applications. Rocket M and airMAX Rocket antennas have been designed to seamlessly work together. Installing Rocket M on airMAX Rocket antennas requires no special tools, you simply snap it into place with the mount provided with the antennas. The 2.4 GHz frequency band is free to use, however, it is crowded due to interference from other wireless devices. Also, there are only three non-overlapping, 20 MHz channels available for use. The Rocket enclosure is built to survive harsh environments and fits the Rocket mount built into every airMAX antenna. You can pair the rocket with the appropriate antenna for your PtP link or PtMP network. Built upon an intuitive user interface foundation, airOS 5 is an advanced operating system for Ubiquiti airMAX product. AirOS provides additional advantages, including protocol support, long-range PtP link mode, automatic/manual transmit power control, automatic distance selection (ACK timing), device statistics, and diagnostic tools. Integrated airView provides advanced spectrum analyzer functionality such as waterfall, waveform, and real-time spectral views that allow operators to identify noise signatures, and plan their networks to minimize noise interference. Waterfall aggregates energy over time for each frequency. Real-time feature shows energy in real time as a function of frequency. Recording automates airView to record and report results. AirControl is a powerful and intuitive, Web-based server network management application, which allows operators to centrally manage entire networks of Ubiquiti devices. It features network map, monitor device status, mass firmware upgrade, Web UI access, management of groups of devices, and task-scheduling. The Ubiquiti Networks AirMAX Omni 2x2 Dual Polarity MIMO Antenna is designed to be compatible with an optional Rocket M BaseStation to deliver 360° wireless networking. This dual-polarity antenna operates under the 2.4 GHz frequency and offers a gain of 10 dBi. It delivers 2x2 MIMO performance and supports airMAX technology, which uses a Time Division Multiple Access protocol to send and receive data at pre-designated time slots. The item "Ubiquiti RocketM2 airMAX PRE-CONFIGURED (X2) + Omni Antenna AMO-2G10 10dBi (X2)" is in sale since Monday, December 17, 2018. This item is in the category "Computers/Tablets & Networking\Enterprise Networking, Servers\Directional Antennas". The seller is "flyteccomputersinc" and is located in Miami, Florida. This item can be shipped to United States.